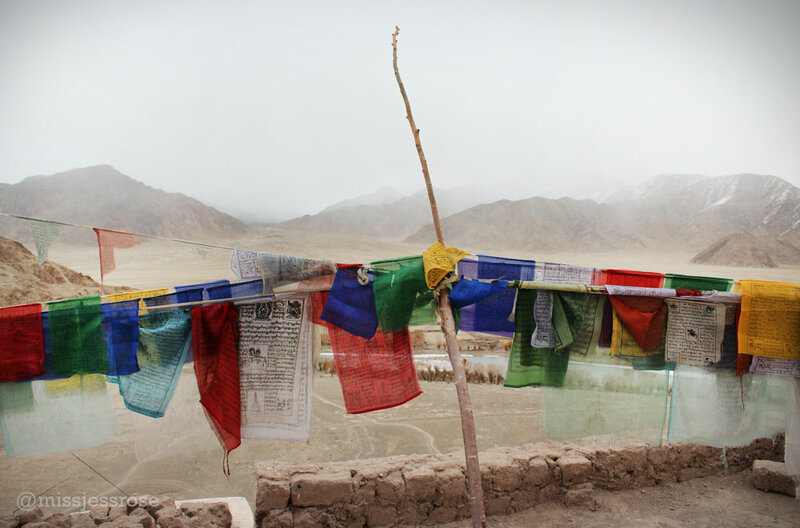 If there's one thing Ladakh is famous for, it’s ancient Tibetan Buddhist monasteries. When visiting this region, exploring these historic wonders is a must-do. Which is why we set out into the treeless, desolate landscape, driving straight towards a looming snow storm. On the agenda: Hemis, Stakna, Thiksey, and last but not least, the Dalai Lama’s summer house. We visit Hemis first, a monastery established before the 11th century, but rebuilt in 1672. It’s one of the biggest monasteries in the region, and monks still maintain it today. After crossing the Indus river, our taxi climbs up a switch back road into the snowy mountains. Many white stupas line the way. A mega prayer wheel with a sign that says: If you spin these clockwise, “it will be very beneficial.” Prayer wheels abound in Ladakh. The temperature is freezing in the higher altitude (we're nearly 12,000 feet) and it being February when we visit, we're in the dead of winter. A single young monk who looks to be about 13, dressed in red robes stands in the entrance, greeting us with a friendly “juleh.” Hemis is completely empty except for us, and in retrospect, I’m glad to have had the crazy, crowded festival experience at Matho on our first day in Ladakh in contrast. As we move through the courtyard, a giant Buddha peers down from a distant, snowy rock above. We set out to explore the inner rooms of the monastery, politely removing our shoes each time. It's painfully cold to walk on the stone floors with only a pair of wool socks. Curiosities fill the monastery rooms. All sorts of holy things sit quietly about — bells, prayer hats, rice, money notes, song books, chimes, food snacks, thick furry blanket cloaks. Everything is so different and beautiful and curious, I take it all in with wonder. The young monk, our silent guide, dutifully takes us from room to room, unlocking and then re-locking each door. The very last ancient holy room we visit is the darkest. There’s an air of the ages here. Two very old, dead goats hang from the ceiling—offerings, the boy tell us. I creep beneath them, hoping no bits will fall upon me as I pass to peer at a row of sitting Buddha figures. The boy lights a candle, patiently waiting as we take in the room. Smoke trails beautifully in the bit of light pouring through the doorway. Snow falls in the background. My feet are cold—freezing cold! He tells us that beneath this room there's a river of blood. Have you seen it? I ask. No, he has not, that's just what he's been told. Next up: Stanka, which means “tiger’s nose,” named after the shape of the rocky outcropping it’s perched upon, amidst an otherwise barren valley. The wobbly, wooden bridge we must cross makes me want to unbuckle my seatbelt should the bridge give way and we find ourselves plunging into the freezy waters of the Indus. It’s so narrow, that the car mirrors graze the prayer flags lining the bridge’s railing. Stanka, established in 1580, offers a 360 degree view of the entire valley, surrounded by white mountain peaks of the Himalayas. A monk pops out to greet us, and begins to silently guide us towards the first room. He is jolly and happy. Inside sit empty benches for monks to sit cross-legged on, musical instruments waiting to be played, and crumpled, red cloaks for warmth that look like ghosts. It’s all very similarly decorated as at Hemis, or as the Indians say, same same but different. The monk picks up a few offerings from an altar and hands them to us—candy and a walnut. He then picks up a mallet and hits one of the large drums. It resounds deeply in the cold room. He points to one of the wall murals, a complex circular painting. "This is the circle of life,” he says. "If you are good, you will end up in one of three segments,” he points towards a section of concentric circles. “If you are bad, there are three areas of bad. You want to move clockwise in life in order to end up in the good." Thiksey also sits atop a hill. Nearly as old as the other monasteries we’ve visited, Thiksey was originally founded in the mid-15th century. It’s incredible to contemplate such old things and to imagine all the people who have passed before me. When we enter the primary inner room, I gasp. At 40 feet, the giant Buddha is impressive— nearly two full stories! Posted signs warn against taking selfies with the Buddha, because all imagery of it is sacred, and to include yourself would be disrespectful. I sit here a long moment, taking in the power of this figure. It is big and golden and smooth. The eyes seem to follow as you move across the room. It’s been blustery, cold and spitting snow the entire day, but by the time we arrive at the Dalai Lama's house, the sun is peeking out from behind the mountains. Each summer when the Lama visits Ladakh, he stays here. As we explore the interior, I imagine his daily ritual of prayer, reading, and peace. Our full day of exploration comes to an end, and we head back towards Leh. Along the way, we spot a row of white stupas with thick layers of fluttering prayer flags. White clouds dance above mountain peaks, sunlight peeking through. We've left the snow behind, but the wind is blowing hard and it’s still incredibly cold. I walk along the row of stupas, spinning all the prayer wheels, contemplating the wonders of such ancient history and hoping for a spin of good luck. 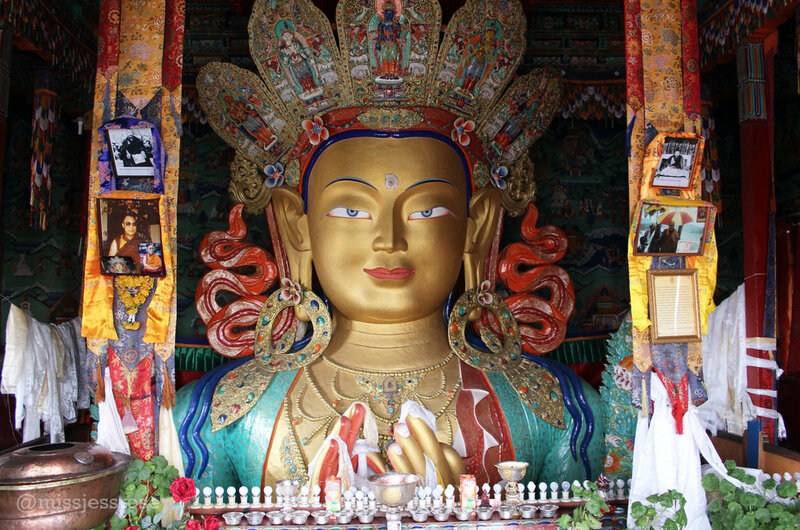 Continuing reading about the ancient wonders of Tibetan Buddhist Monasteries in Part 2 here.